This brass instrument with steel points is contained in a cylindrical metal case and provided with steel accessories such as straight and curved points, pencil-holders, paper cutters and so on. Each required accessory could be inserted into the brass legs and held by a screw. 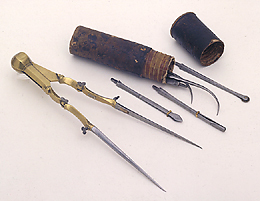 In its various permutations, this instrument could serve as compasses, as dividers, as a caliper and for marking up drawings. The instrument is known as the 'Michelangelo' compasses, because it was found amongst the possessions of Michelangelo Buonarrotti.